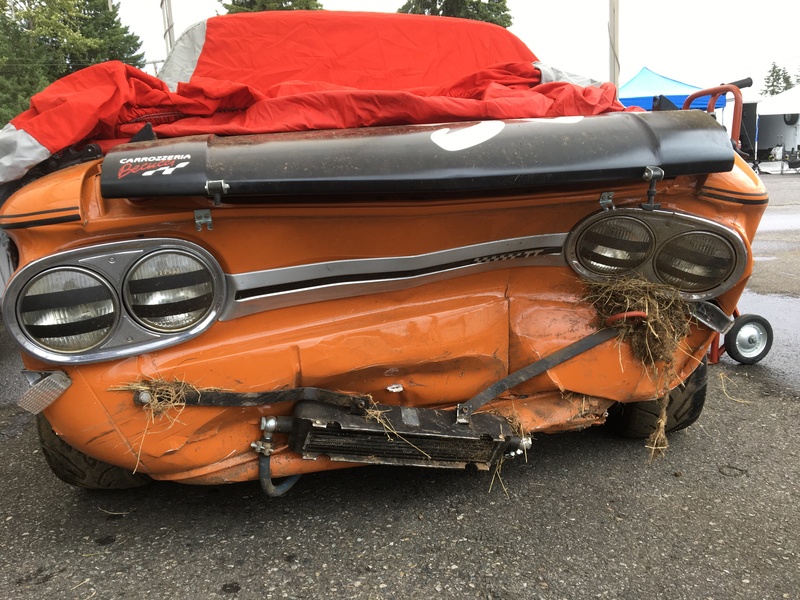 The ‘Before’ picture of both cars. 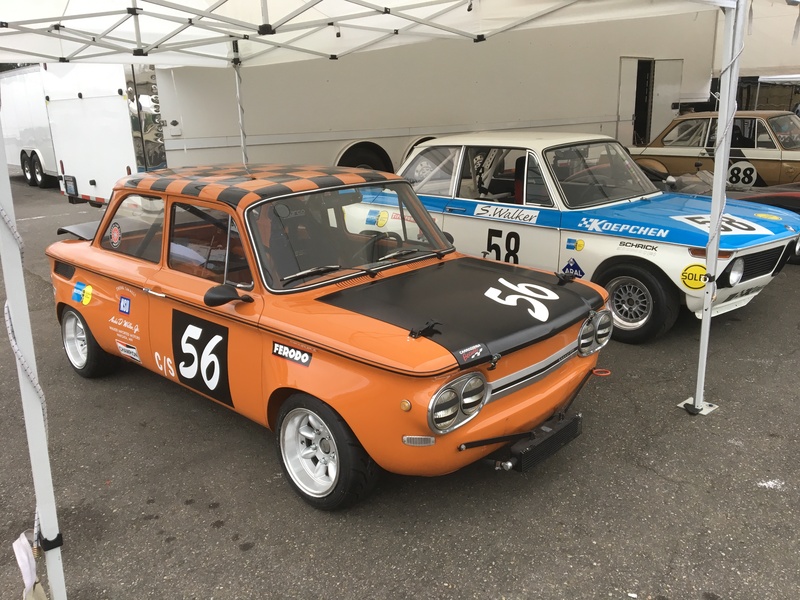 We raced the Koepchen 2002 and NSU 1200TT at the 2018 PNW Historics on June 29- July 1. The weekend turned out tube a real mixed bag. The 2002 ran well all weekend, but the driver was off his game just a little. The NSU was a lot of fun to drive, but its run came to an abrupt end on Saturday afternoon in the rain. This was the first outing for the NSU. I had purchased it last winter and had it shipped to Seattle. After its arrival Jim did a thorough inspection and came up with a list of items needing attention. I had him work through the list and get the car ready for this event. It needed new seat-belts, an updated fire system, some electrical sorting, etc. Nothing major. I was pretty excited to get to the track and see the car all ready to go. I was even more excited to get in it and have a go. I last drove an NSU back in 1971. I had a car just like this that I autocross, ice raced, and did my first SCCA Driver’s School in. I then sold it and built a Mazda RX-2 to race. I should have kept the NSU! Everything went well with the NSU until Saturday afternoon. I had entered it in the USRRC race to get some extra seat time. After about 3-4 laps rain moved in from the west end of the track, which means Turn 2 got wet first. After I ran out of talent. My first time through the turn I spun. The second time through Turn 2 I started to spin, caught it, but the car snapped back the other way and went straight off into a dirt bank. OUCH! The K2002 had a better weekend. It had no problems and ran perfectly all weekend. I just was not on my game for this event. in my defense, I did get hit by another competitor in the first race. The other driver wanted to blame me for everything. I wanted to call it a racing incident. You can watch the video and make up your own mind. Since car week is finally complete, I figured now would be the time to finally dump my contact info in here for ya so I can keep in touch for future vintage races! Thanks again for letting me take a look at your car in such detail, it was great to meet both of you, and hope to see you guys again soon!